This spring has felt like a new beginning for me in many ways, since the book I started two years ago finally came out, and Séville à l’aube, which has been part of my life for as long, finally acquired its physical, commercial shape. Proud accomplishments both, though in truth they make me feel a little bereft. The book and perfume have become products, put out by companies to be bought by people in the real world, who will deal with them as they please. I haven’t moved on to a new book yet since I am still finalizing the French translation of The Perfume Lover. But I am working on new fragrance developments. Since last December, I am also the perfume editor of Citizen K. This is hugely fun, since my boss, the brilliant and fearless Maïté Turonnet, encourages to be irreverent and quirky, a rare privilege in the glossies. Between evaluating mods and going to launches, I am smelling more things than ever before, which means that every once in a while, I need to go back – or discover – scents that will hit the reset button. Edmond Roudnitska’s Diorissimo and Eau Sauvage (the pre-reformulated version) and Le Parfum de Thérèse work a charm for that, but I’ve already quoted them several times in these seasonal round-ups. So here is my selection of products that feel, for various reasons, like a fresh start. Molecule 01 by Geza Schoen for Escentric Molecules. Surely the ultimate reboot: starting from scratch with a single molecule, ripping the discrete but ubiquitous iso E super from the depths of perfume formulas where it smoothes out bumps and gets other notes to play nice with each other. Therefore transforming our odor sui generis into the formula. Aedes de Venustas eau de parfum by Bertrand Duchaufour. Twice a revolution: giving the tart green rhubarb accord unprecedented power and using it to skewer the darkest chypre, slicing open the classic pyramid structure. The effect is an intensely contrasted green/black fragrance that feels like a plant shoot ripping open black earth on its way to the sun. A fresh start for the perfumer, who is keen to explore what he calls “crazy accords”. Infusion d’Iris Absolue by Daniela Andrier for Prada. The original is already a modern classic: for Octavian Coifan, it is the Chanel N°5 of the 21st century. In this new interpretation of the heraldic iris, the blinding brightness of the sprightly green notes gives way oriental balsams, with added richness brought by orange blossom absolute. While I found the original too cool and clean to feel comfortable in, the added contrast of balsamic notes draws me in. Can perfection be improved on? Apparently, when you’re Daniela Andrier, it can. Antonia by Annie Buzantian for Pure Distance. The IFRA-vandalized Diorissimo can no longer pretend to the “ultimate spring floral” title. Antonia is a contender: as impeccably modern and pared-down as Roudnitska’s masterpiece in its day. Too delicate to fit into any niche code, Buzantian’s abstract essay on the spirit of vernal flowers, centered on a tenderly fruity magnolia, is a fresh start on the theme. This is the type of new classic that luxury brands should be giving us. Chanel N°18 by Jacques Polge. Clear and palate-cleansing like a shot of Poire Williams spirit, this iris-rose-ambrette accord is as facetted as the Chanel Joaillerie diamonds that purportedly inspired it, and just as limpid. After Midnight by Émilie Coppermann for The Different Company. Like Chanel N°18, this “faux de cologne” plays on the limpidity of ambrette, associated with angelica, another vegetal musk, whose herbaceous facets blend with green lentiscus. Radiant and bracing. L’Éther by Olivia Giacobetti for Iunx. Ether: “The element believed in ancient and medieval civilizations to fill all space above the sphere of the moon and to compose the stars and planets.” A prickly saffron-rose-myrrh vibration, underlain with incense and de-materialized sandalwood: this is what the Fifth Element – literally the quintessence – must smell like. L’Eau de Chloé by Michel Almairac. The feel of a fresh start can also come from a new way of working a note into a scent. In L’Eau de Chloé, this new way is also one of the oldest: using rosewater for rose, a premiere in fine fragrance and an intensely natural effect. Corps et Ames edt apaisante by Pierre Guillaume for Parfumerie Générale. To start anew you don’t necessarily have to start from scratch. Here, Pierre Guillaume revisits an earlier piece, making the 2006 Corps et Ames more contrasted, expressive and exhilarating. Pohadka by Vincent Micotti for Ys Uzac. You can get the feel of a fresh start by delving into a note that is little explored, or discovering a new voice in perfumery. Though it is more autumnal with its harvest-time golden tones and deep hay-tobacco-moss hues, Pohadka felt like spring because I hadn’t smelled anything entirely like it before. For more Top Tens of spring, click to: Bois de Jasmin, Now Smell This, Perfume-smellin' Things and The Perfume Posse. Everything about the Aedes de Venustas Eau de Parfum seems to be just right - The fragrance sounds fantastic, that bottle is amazing and the box is just beautiful. I can remember first seeing the IUNX fragrances in Wallpaper magazine at around 2003. From what i can remember, the IUNX shop had lilly-pools and looked like some kind of art gallery. And didn't the fragrances come packaged in a black plastic pod ?. I think that shop has long gone, now. Chris, Aedes is apparently doing so well they can barely keep up with production, which is certainly an excellent sign. As for Iunx, yes, the boutique was wonderful but in a street where it was entirely impossible to get walk-in customers. It was closed years ago. The fragrances are still sold in the boutique of the Hotel Costes, and in a black foam pod that's so chic you want to exhibit it. I am fond of lists!!! Ditto on Aedes de Venustas (makes me happy, it's like those fizzy sour sweets that explode in your mouth), Infusion d'Iris Absolue (liked the original but was too sheer, must get a FB of this reinforced version) and L'Eau de Chloe' (surprisingly made a really good impression when I tried it last week for the first time on the cutest perforated paper tester). Silvia, I'm happy but not astonished that many of my favourites among recent launches are also yours. I've only sniffed a couple of these - looking forward to great spring sampling! Denyse, you have reminded me of a friend who broke out in huge hives on her way home after turning in her dissertation. Nozknoz, thank you for saying such lovely things about the book! I must admit it's a bit difficult for me to see the destiny of Séville à l'aube so utterly out of my hands. In an ideal world, I'd have put it out in my own brand. Still, it's not as though I'm crying in my pillow! I hope people buy gallons of it, and convince L'Artisan Parfumeur of including it in their permanent collection. It's so beautiful I think it'll be very sucessful. I'm very curious to try Infusion d’Iris Absolue. I love the original and wear it often, but can one resist "an improved perfection"? I don't think so! Victoria, I can't imagine you won't love it. I have trouble wearing the original because I find it a tad too bright. To me, this version gets it just right - at least for my personal taste, since otherwise I think it's superb. The Prada is the biggest temptation I've had so far this year...might just have to buy it even though I already own "regular" Infusion. Robin, I've got a full bottle and God knows I'm not moved to get many of those these days! Gator Grad, my info is last week of July. Counters may receive tester bottles before that, but they don't have them yet (I've just checked this morning). It's announced as a limited edition, though I should imagine if it sells well, that might change. I suppose that it will become more widely available in September, but since I don't work for L'Artisan, I'm not privy to their marketing plans. I miss Diorissimo so much. The new version just doesn't have the same effect. I am a 28 year old American woman whose tastes are very different from others of her age group. While my high school classmates were marinating in cucumber melon body sprays, I was wearing Opium (borrowed from my mother) and Chanel No. 5 parfum (a birthday gift)! Your list has given me some lovely new ideas for spring perfumes. Lately I have been turning to No. 5 Eau Premiere and Goutal's Rose Absolue for their flowery glow. Elizabeth, your choices for spring are splendid. Eau Première is a scent that made me cry out with joy when I discovered it! I have discovered Chamade edt this year, but a bit too late for a full bottle this year. The Aedes de Venustas is really something special, the rhubarb note is a true to life representation of the green rhubarb (so more piercing than the red rhubarb). To my nose there's not so much incense, a note which is difficult for me and which I usually keep away from. I am sure I at least need a decant! Very good to see a list with a good variety of scents, thank you for keeping us informed. 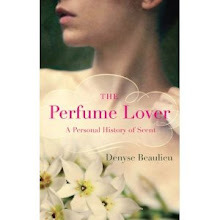 I've read "The Perfume Lover" in one go, Denyse, starting this morning; it was too good for me to put down at all until the very end. 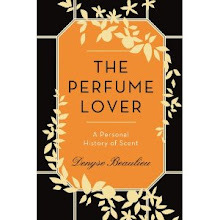 Thank you for this fascinating insight into Perfume, creating perfume, and Life. Lovely work, a true pleasure to read, and I shall reflect upon the insights provided for some time to come. Many thanks. I was able to smell the empty sample bottle of Vanessa's Seville a l'Aube, and its potency was very apparent. It'll be a real treat to experience the full fragrance when it is commercially available. Anna, your words really made my day! I'm getting very kind emails and comments from many people... I'm happy you enjoyed that little sniff of Séville à l'aube. Judging by the looks on people's faces when they get that first whiff, I can't help thinking it'll be a great success. Because that look can't be faked!